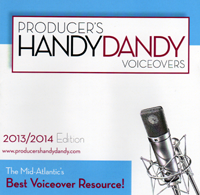 for BEST MALE VOICE-OVER SPOT! See them on demos page. WILL ROSSER is an Award-Winning VOICE-OVER, ACTOR, NARRATOR in the Washington DC area, with over 20 years experience that spans the advertising, entertainment, and communications industries... TV, Radio & Web Commercials & Videos, Documentaries, Government and Corporate Training Videos, Promos, PSAs, VOG Live Announcing... just about any production that calls for a VOICE. If you think a professional costs a lot, WAIT til you hire an amateur. If you're early, you're on time...if you're on time, you're late.